Toronto ACORN members advocate for a raise in the minimum wage. As anyone familiar with the price of a transit pass, pack of razor blades or dental X-ray should be able to compute, you cannot live on Ontario’s $10.25-an-hour minimum wage. Not really. Ontario's move to raise minimum wage to $11 per hour Thursday was greeted by very mixed reaction in Ottawa. CBC Ottawa Morning: How do you put a dollar figure on minimum wage? Ottawa ACORN member Jessica Pearce talks about the Minimum Wage campaign on CBC Morning Ottawa. Read more about CBC Ottawa Morning: How do you put a dollar figure on minimum wage? Grace Iyabosa sits with hospital patients through the long nights, close at hand in case they need help. BC ACORN is pressuring Social Development Minister Don McRae to remove “claw backs” when someone is a recipient of both child support payments and disability support. ACORN held a rally outside the constituency office of Yasir Naqvi, Ontario Minister of Labour, on Friday, January 17, 2014. ACORN Canada is an independent national organization of low and moderate income families, who are asking the Ontario government to raise the minimum wage to $14 and subsequently index it to the cost of living. Le groupe ACORN a manifesté vendredi devant les bureaux du député d'Ottawa-Centre et ministre du Travail de l'Ontario, Yaser Naqvi, pour demander au gouvernement de fixer le salaire minimum à 14$ l'heure. A rally to raise the minimum wage in Ontario to $14 per hour was held outside MPP Bob Chiarelli’s office Nov. 14. 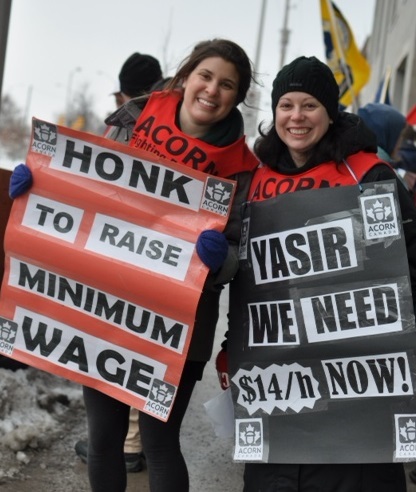 The campaign to raise minimum wage was led by various community, labour, and student groups across Ontario including ACORN Canada, an independent national organization of low and moderate-income families striving for social and economic justice in the country.